I found a loaf of whole wheat Italian bread at the store that looked so good. And that was how tonight's dinner came together. I marinated the Chicken breasts in olive oil, lemon juice, fresh oregano, salt and pepper. I took the roasted peppers out of the freezer early in the day. The tomato was from Jake's farm stand. Chris grilled the chicken and the bread. 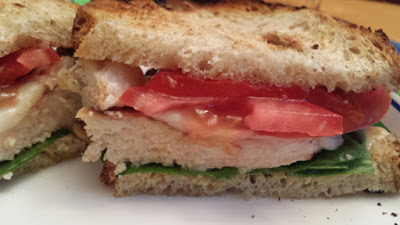 We even added some fresh spinach to the sandwich. Perfect! We Are Having A Fig!